Home Uncategorized What are antioxidants? Antioxidants are natural substances that may stop or limit the damage caused by free radicals. Your body uses antioxidants to stabilize the free radicals. This keeps them from causing damage to other cells. Antioxidants can protect and reverse the damage caused by oxidation to some extent. Living organisms have evolved a number of antioxidant defenses to maintain their survival against oxidative stress (R). In order to avoid free radical overproduction from oxidative stress, antioxidants are present in tissues to neutralize these free radicals (R). An antioxidant is a substrate which protects biological tissues from free radical damage. Biological reductants can regenerate or recycle the antioxidants (R,R2). Antioxidant defense mechanisms involve both enzymatic and nonenzymatic strategies. (R). 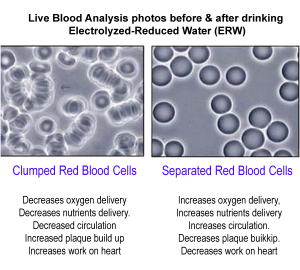 The Limitations of Most Antioxidants Most antioxidants are very large, having large molecular weights such as shown below. Since these molecules are so large, their transport into areas where they are desperately needed, which is inside the cells, is very slow and require the aid of active transport. They also need to be absorbed through the they are desperately needed, which is inside the cells, is very slow and require the aid of active transport. They also need to be absorbed through the digestive system. It’s difficult to get a high dosage of antioxidants to reach the cell since other things are being absorbed and digested as well. Another important fact is that the brain gets the most oxidative stress damage because our brain consumes the most oxygen. However, most antioxidants cannot get past the blood-brain-barrier to neutralize free radicals in the brain. 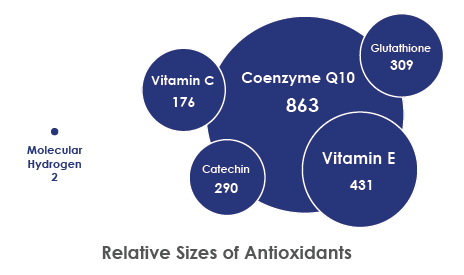 Most antioxidants turn into weaker free radicals themselves after neutralizing free radicals. As shown right, when ascorbic acid donates a hydrogen and an electron to a free radical (R^) it becomes an ascorbyl radical, a weaker free radical byproduct. This ascorbyl radical needs to be taken care of by enzymatic processes which requires resources and energy. How can we stop this cycle of oxidation? 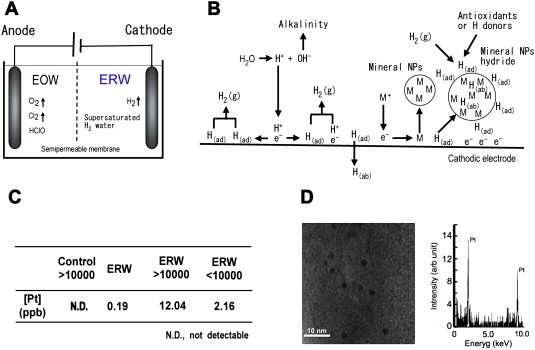 Studies on the functions of n electrolyzed reduced wate ( ERW ) were initiated in Japan in 1931. In Japan, research on functional water, especially on reduced water, is developing at a rapid pace. 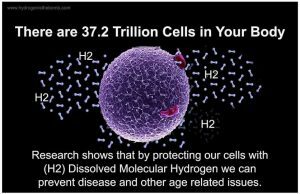 Reduced water such as electrochemically reduced water and natural reduced water can scavenge reactive oxygen species in cultured cells. Reduced waters are expected to have preventive and positive effects on oxidative stress-related diseases such as diabetes, cancer, arteriosclerosis, neurodegenerative diseases, and side effects of hemodialysis. It has been suggested that the active agents in reduced water are hydrogen (atoms and molecules), mineral nanoparticles, and mineral nanoparticle hydrides. We now have a simple solution which is simply by drinking high quality hydrogen rich Electrolyzed-Reduced Water (ERW) . The extraordinary antioxidant properties of this water has been recognized by scientists, chemists & engineers. This water is rich with simple nano-particle antioxidants called free electrons. You see when an electrical currant passes thru water (electrolysis) some of the water molecules break apart creating Hydroxyl ions (OH-) & Hydrogen Gas (H). When Hydrogen molecules are exposed to platinum, they release their electrons. These electrons are directed down a wire where they produce electricity & become part of the alkaline drinking water. The stronger the current of electricity & the more platinum the Hydrogen Gas is exposed to the more Molecular Dissolved Hydrogen Gas is produced which creates Free Electrons. With these Free Electrons & the power they have to “reactivate” the body’s own healing ability, the downward cycle of oxidation can be STOPPED! This is the Simple Truth & the Most Powerful Antioxidant on the planet!